For concrete repair and concrete restoration projects, specify AQURON 7000 corrosion protection for concrete. This spray-on treatment is the simplest and most cost effective method for protecting and extending concrete structures durability and service life. GREEN FOCUS - Simple to use & more environmentally friendly - Aquron 7000 spray applied concrete protection has no VOC or hazardous ingredients such as cacogenics like other solvent and cement based waterproofing products & treatments. Permanent Concrete Protection & Waterproofing - Aquron 7000 concrete protection for Concrete produces a hydrogel and transforms moisture throughout porosity. Being inside the concrete, makes the Aquron 7000 concrete protection and waterproofing as permanent as the concrete itself. 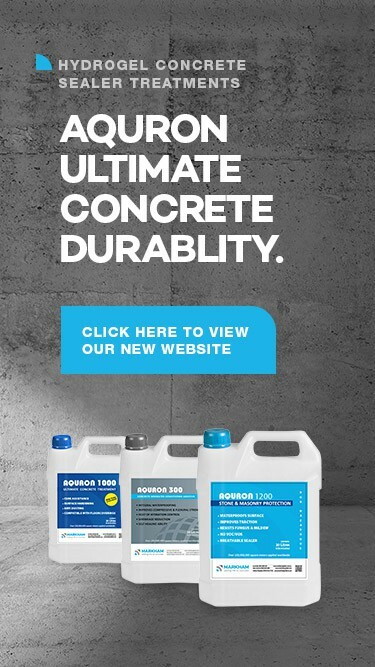 GUARANTEED PERFORMANCE - AQURON 7000 spray-on concrete protection & waterproofing offers project specific 15 year warranty.